As one of South Africa’s first two new institutions of higher learning since 1994, Sol Plaatje University (SPU) is envisaged as a symbol of our new order of democracy, inclusiveness, growth and opportunity. From the perspective of urban design it demands that the institution is both a centre of academic quality, excellence, innovation, relevant to and engaged within its settings and able to create a growing knowledge environment of the highest standard. Since the start of the infrastructure programme R1,5 billion has been invested in the development of the two new universities enabling both to start their academic programmes in a variety of renovated and purpose-built new buildings on fledging campuses. In order to support the academic mission all solutions to physical planning needed to be comprehensive, with nothing considered in isolation. Issues of building placement, traffic and parking, engineering systems and aesthetics were all woven together to form a tapestry of buildings and spaces that foster a successful academic community. Promoting integration in a society historically obsessed with separation was a starting point for the planning of the university campuses. Optimising spatial integration with the host city requires the campus plan to manifest knowledge development in all its facets, by designing public spaces, squares and parks to facilitate the occurrence of public meetings, events and exhibitions, and thus maximizing sites for exchange. The university campuses were designed with the understanding that students come to shared spaces with simple needs; rest, relaxation, recreation and respite, but the spaces also enable chance meetings, foster exchange, stimulating ideas, giving hope and a sense of possibilities. The idea of sharing, which is a particularly positive African notion, is reinforced by the provision of multiple common spaces on the campus ranging from focal squares, to parks and tranquil courtyards. These common spaces are designed to inspire, foster appreciation of what is good among us, and broaden the student community capacity to imagine and create a better future. They are places with no copyright, students share them, benefit from them. They are the interface of university exchange and a platform for learning with the broader community. For too long our university campuses have focused primarily on the individual faculty buildings, with little regard for the open space surrounding it, or the greater campus setting. To maximise learning and exchange, both new universities have used shared and common spaces as the drivers and backbone for the campus plan. Open spaces of varying size, form and function have been planned to link via pedestrian and non-motorised routes, forming the stage onto which all the new university buildings face. Campus buildings have been planned to engage with and focus onto the common spaces, allowing a variety of activities such as restaurants, shops, coffee shops, book stores, banks and laundries to spill out onto these public spaces. Until recently, universities tended to emphasise their role as places for teaching and research, with a minority of students in residences and the rest left to arrange their own accommodation. The two new universities underline the positive aspects of students living on or close to campus in ‘living-learning communities’. These communities are seen as enhancing integration and orientation, promoting students’ intellectual, cultural and social development, and improving retention and academic success. The Department of Higher Education and Training committed both new universities to a large proportion of campus based student residences. Campus residences will accommodate up to 80% of Sol Plaatje University students. Providing student housing for high numbers constitutes a large portion of the infrastructure spend and is an important component of the overall campus. Creating a sense of community and belonging, a home away from home and an environment that uplifts the human spirit is integral for providing an environment conducive to cross collaboration with other students and researchers from different sciences and levels of study. With this in mind, student residences were designed to be more than dormitories, becoming places of mixed use by including seminar and teaching spaces, study areas and even entertainment zones. The residences are arranged as several smaller buildings clustered around varying central courtyards and gardens, which is an ideal configuration to encourage their residents to informal gathering and meeting. The courtyards are quiet and partly shaded outdoor spaces that serve as a transition between individual apartment units and the broader campus. Moving away from traditionally planned faceless corridor dormitories, students are instead clustered into smaller groups around shared amenities to ensure their greater sense of cohesion. 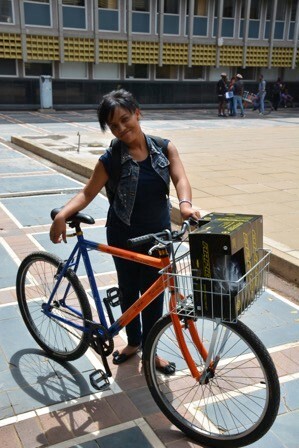 Most South African university campuses are dominated by private vehicular movement and parking zones. Not only does this detract negatively from the quality of the campus environment, but it also drains valuable resources from the academic programme. Planning for a more balanced movement network entails a fundamental shift of focus onto non-motorised transport and the pedestrian. Universal access is a further component of the inclusive university design, and aims to produce buildings and environments that are inherently accessible to people with disabilities. Equity of access demands that all have equal access to all facilities and amenities on campuses. The principles of Universal Access have been used from the onset of the planning and design process to promote human equity and dignity. This includes ensuring that all renovated and newly constructed buildings are free of potential environmental barriers and follow consistently accessibility standards throughout the campuses. By ensuring ease of access to the university campus, the shared spaces and facilities support independent living and full participation in all aspects of university life, ultimately reinforcing the inclusion and integration of diverse members of society. In the past architects designed campus buildings to meet the needs of specific programmes or faculty. It was assumed that the programmes would never change, and buildings were constructed accordingly; solid and often inflexible. But no more. At both new universities, flexible and resilient building design is the point of departure. Over the course of eight years the Department of Higher Education and Training has supported the development of infrastructure expansion at South African universities. A large variety of buildings has been developed, all showcasing best practice in accommodating greater number of students, lecture venues, laboratories and support amenities. These examples were hugely beneficial to the design and planning of the new universities and were used as precedents in guiding the development of the new buildings and facilities. This, together with the aim of creating resilient structures that can accommodate a greater mix of academic spaces, forced the development of new architectural typologies, which stand in contradiction to traditional single use academic buildings. In the first phase, multi-purpose buildings were constructed to accommodate the developmental nature of the two universities’ respective academic programmes. These included libraries, residences, multi-purpose teaching venues, offices and student support, all of which were completed in time for the 2016 academic year. The development of the new universities offers an opportunity to showcase best practice in environmentally sustainable architecture and infrastructure development. In order to realise healthy and comfortable buildings, strategies founded in response to local condition are a necessity. Information on local climate, wind, sun exposure and temperatures for the two respective areas were fundamental to the design of buildings, infrastructure and outdoor environments. The universities have been developed on the basis of a comprehensive environmental strategy encompassing transport, health, energy, water, and waste to bolster their ambitious socio-economic target. This design philosophy is captured in a Sustainability Charter, establishing their stance on environmental performance through mandating the ideals of the Sustainability Master Plan. The development of both the overall campuses, and their buildings eliminates negative environmental impact by adopting a sensitive design approach. A focus on rainwater harvesting, grey water application, renewable energy, air purification, environmental remediation, energy conservation, eGain forecasting and the integration of proven building and infrastructure design are all principles employed to improve the living and natural environment. Deliberate placement, form and orientation of buildings with respect to local conditions provides for favourable micro-climates in all spaces. The latest research in bio-climatology was applied to the architecture, greatly reducing the need for heating and cooling in the buildings. Passive strategies, utilising locally attuned responses to the distinct environmental conditions found in Kimberley and Nelspruit were key to creating self-sufficient and low energy solutions. The same sensitivity was fundamental during the design of the landscaping and public spaces. Here the focus was on designs where only indigenous trees are planted, water runoffs are contained and reused, and local materials applied attuned to attractive public spaces. As the first new universities to be developed since 1994, the architectural language strives to be representative of our democracy, expressing a deep understanding of its sense of place. Whilst both universities are designed to be of their place and of a distinct African appeal, the architecture is further underpinned by “dignified utility”, that is both essential and economical. This sees the emergence of an architecture that is being of, and recognizable as part of South Africa. To ensure that both campuses have meaning, the architecture is bound in the human experience of the environment, and not a mere manifestation as artifact. The quality of space created by the holistic campus designs is instead focused on atmosphere, joy, surprise and wonder. The campus environment expresses the interplay of textures and colour, the shifting mood of light through day, of smell and sound. It is about designing sensual space that invokes interactive emotion. These facets are all closely related to and chosen from their respective direct contexts. It follows that a distinct African appeal emerges -simple, straightforward and honest use of materials; bold articulation of forms, subservient to and yet respectful of the natural environment; a gentle composition of colour, texture and patterns woven into fabrics and bricks that allow the passage of light, direct the breeze, create silence and finally protect. Out of this emerges an architecture which makes the University of Mpumalanga and Sol Plaatje University unique and distinct. We are designing with hopefulness and confidence, an injunction to be effective but with planned expansion predicated on budgets provided by a developing economy. Bearing in mind that universities are built for the ages, they also seek to both celebrate the achievements and critically assess the impact of the multiple and diverse projects which have been transforming and augmenting the higher education landscape. Inside all these new university buildings, sitting in the lecture theatres, working in the laboratories, populating the residences, utilising the libraries, IT and recreational facilities, are South Africa’s next generation of professionals, artisans, managers, technicians, academics and researchers. Both universities are forging ahead with their expansion and physical capacity, continuing to target their aim to be centres of academic quality and excellence, innovation, relevant and engaged within their settings. In the case of Sol Plaatje University, designing the campus into the fabric of the city was paramount, forcing it to act in a civic manner, participating with all the functions of the host city. To further enhance the principle of full integration and inclusiveness no distinction is drawn between the plan for the university campus and the plan for the City of Kimberley. The reduced impact of the mining industry on Kimberley requires the university to fill a greater role in regeneration of the urban fabric, a responsibility only achieved if the campus is cohesively integrated within the city. Universities are increasingly expected not only to conduct education and research, but also to contribute actively to the economic, social and cultural development of their regions and host cities. 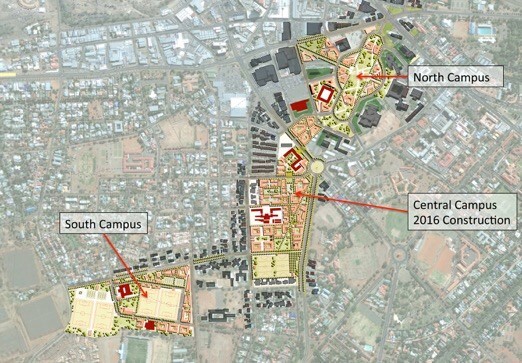 The civic nature of the campus plan uses its location to help form the identity of the university and provides opportunities for prosperous grow for both learners, businesses and public institutions. An example of this involves the integration of the Oppenheimer Memorial Park into the Sol Plaatje University campus. The park was formerly the setting of the Malay Camp, home to thousands of migrant workers in the mining industry, evicted in the 1950s to make way for the expansion of the Kimberley Civic Centre and the creation of a new park. The City of Kimberley and the Sol Plaatje University have made the Oppenheimer Park a shared responsibility, addressing social injustice, commemorating the heritage associated with the land, but also creating a generous, active and eminent urban gathering space for the whole city to enjoy. SPU is its way to preparing new buildings for 2020 and 2021. SPU in response to the local community call to be involved in the Capital Developments projects procured 9 contractors: Major Works, Medium and Refurbishment Works, Small Works and Civil Works. This has provided for 6 local contractors to be involved. The Major Works Contractors will be involved in the Incubation Programme which provides further opportunities for work as subcontractors. Those on the Incubation Programme are mentored by Northern Cape Public Works Department Construction Mentors, Finance Management Instruction from the local SEDA and potential help from the Northern Cape Department of Economic Development and Tourism. The main contractors appointed will complete buildings on the Science and Education Precincts on Central Campus and the Bulk Services Building and a Student Canteen on South Campus. Planned on Central Campus for occupation at the beginning of 2020 is the Natural and Applied Sciences (NAS) Academics Office Building which includes a 165 seater raked auditorium and offices for the Head of School and Heads of Departments. Mid-year 2020 the NAS Applied Sciences Building will be available. This building contains on the ground and 1st Floor, 2 x 320 seater raked auditoriums, 2 x 180 seater raked auditoriums and 4 x 90 seater classrooms which will increase the generic classroom options substantially. Also mid-year 2020 the Arts Block, designed for both Humanities and Education will be available. This building includes facilities for the Education Foundation Phase and Humanities Heritage Programmes. South Campus will see the building of an iconic concrete building housing all the bulk storage water requirements, potable water, fire water, grey-water and their associated filtration and pumping systems. Also included here are the standby-generator, LV Metering and the chillers for TABS (Thermal Activated Building System). Once the contractor has completed this building he will proceed on to a Student Dining Room which will be open from 7H00 until 21H30 in order to provide meals for the Student Housing in South Campus and adjacent properties. The appointed Medium and Refurbishment Contractors have commenced with two projects for completion in 2019. The final phase of the upgrade to Luka Jantjie House; this upgrade will be done in three stages as the current classes and staff in the building have to be accommodated and Health, Safety and Security maintained through the process. The other building will be the much awaited upgrade of the Community Hall and the building of a Staff Recreational and Mini Conference Centre on South Campus. Works for the three contractors here are included, a Gatehouse and Staff Facilities on South Campus, a Staff Facilities Building and upgrade of the Gatehouse at Luka Jantjie House and the provision of Directional Signage throughout the Kimberley allowing all our future staff, students and guests to be directed to each of the three campuses. Additional work will include brickwork walling on South Campus. The appointment of Civil Contractors will able the use of our current tranche from the Northern Cape NLC in the building of a combination cricket oval and 2 rugby/soccer fields, i.e. the cricket pitch lies between the two soccer/rugby fields. In addition to this the full extent of South Campus will be served with ring mains which carry electricity, data fibre optic, water (potable and fire), waste water (grey water for irrigation), sewerage and the TABS supply to all future buildings on South Campus. 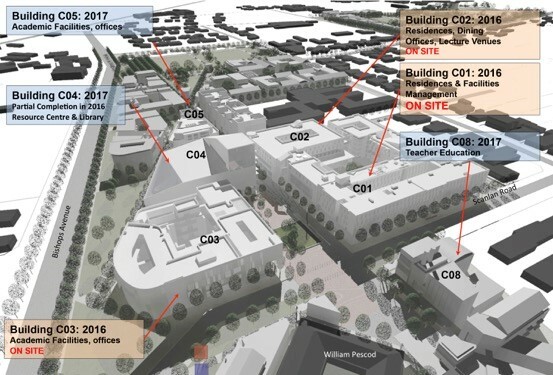 On Central Campus, work with include the full upgrade of Scanlan Road including the pedestrian crossing between the Central Campus Square and the Education Precinct ensuring that both are connected as Central Campus. Further to this is the upgrade to the N8/N12 traffic lights into a five entry point circle the same size as the Monument Circle on the N8. The provision of the circle will make the peak traffic movement at this point easier and with less restrictive flow. Civil works also include the external works and landscaping, soft and hard, around each new building.